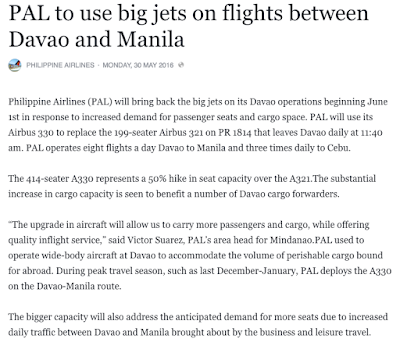 Philippine Airlines Promo 2016: Philippine Airlines (PAL) will bring back the big jets on its Davao operations beginning June 1st in response to increased demand for passenger seats and cargo space. PAL will use its Airbus 330 to replace the 199-seater Airbus 321 on PR 1814 that leaves Davao daily at 11:40 am. PAL operates eight flights a day Davao to Manila and three times daily to Cebu. The 414-seater A330 represents a 50% hike in seat capacity over the A321.The substantial increase in cargo capacity is seen to benefit a number of Davao cargo forwarders. 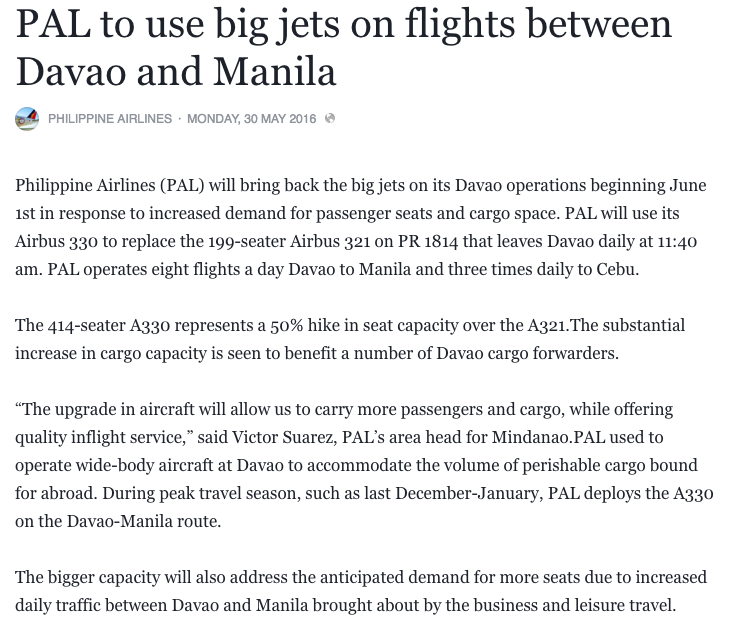 “The upgrade in aircraft will allow us to carry more passengers and cargo, while offering quality inflight service,” said Victor Suarez, PAL’s area head for Mindanao.PAL used to operate wide-body aircraft at Davao to accommodate the volume of perishable cargo bound for abroad. During peak travel season, such as last December-January, PAL deploys the A330 on the Davao-Manila route. The bigger capacity will also address the anticipated demand for more seats due to increased daily traffic between Davao and Manila brought about by the business and leisure travel. it is so exciting...can't wait!